The idea for this post and some others that I’ll *hopefully* be able to write comes from the book Pauses For Pentecost by Trevor Hudson. It’s a 50 day devotional designed to be used between Easter and Pentecost. Each day invites the reader to take a few minutes and ponder a specific word on the journey of Eastertide. I have a love/hate relationship with daily devotionals. Every once in awhile I’ll come across one that is really meaningful, but often they come across to me as so much fluff. Now, sometimes I need fluff. However, on days when I don’t need fluff, I often have a hard time connecting with devotional literature. I have daily scripture readings that I do, but I don’t know, devotionals don’t tend to meet me where I’m at. Now it’s only been a few days, but so far this one has been different. I hope it stays that way! It’s really been speaking to me, and we all need that in our spiritual life. What I’m about to write is intensely personal. Originally I wasn’t going to put this up on here, but I was encouraged to do it because maybe my story would help others in similar circumstances. I hope that’s the case. The first word that Pastor Hudson invites us to consider is the word “STONE.” We know from the Gospel accounts that a large stone was rolled in front of Christ’s tomb after his body was placed inside. When Mary Magdalene and the other women came to prepare the body on Easter Sunday morning, they wondered who would roll away the stone for them. Matthew’s account (Matt. 28: 1-10) is quite dramatic, saying an angel appeared like a bolt of lightning, scaring away the tomb guards and rolling away the stone. Trevor Hudson suggests that in much the same way that the angel had to roll away the stone from the tomb before we all could experience the totality of the joy and new life that comes with Easter, we often have stones in our lives that need to be rolled away today. Oftentimes those stones reside inside our own hearts. The Bible talks about “hearts of stone” on a few occasions, one of them being the verse in Zechariah that I listed above. Sometimes we might purposefully make our hearts like stone and reject God’s teaching. That comes with certain consequences. Those can be hard stones to roll away for sure, but I don’t think they’re the only kind of stones our hearts can turn into. Maybe someone has made you so angry that you’ve developed a heart of stone toward them. Maybe something has hurt you so much that you have felt the only way to protect yourself is to turn your heart to stone. Maybe you’ve failed so miserably at something and been damaged so badly that you felt that you had no choice but to turn your heart to stone. It’s almost like a defense mechanism, isn’t it? Hudson asks us to think about what the stones are in our hearts that need to be rolled away. I didn’t have to think about it very long at all. You see, I have a good portion of my heart that’s been turned into some really hard, first rate stone. Sometimes it seems so hard that nobody could penetrate it or roll it away. My stone is the failure of my marriage. I told you it’s personal. You see, for the most part I’m fairly confident. I’m good at my job and have gotten no shortage of accolades for it. As I pursue ministry again I’m very confident in my ability to teach and preach, and my regular job working the public has gone a long way toward helping me deal with people. But one part of my life is still rather shambolic. In 2007 I married a wonderful young lady that I had known for about three years, though a large part of that time was online interaction. That summer I left all my family and friends behind as well as everything I owned except for what I could fit in two suitcases. I moved to Florida via airplane with no job, a brand new degree in Forensic Science, and only the skeleton of a plan for the future. You might be tempted to say, “Wow, what a step of faith!” Trust me, it was anything but that. I call it my Jonah experience. I was running away from many things. I was running away from a job that was a dead end, from a family that loved me but that I was convinced didn’t have the first clue about what was best for me (I was so wrong), from a staunch and suffocating conservative culture in Utah that didn’t line up at all with my own more liberal views, from a closed church and a false start at ministry, and most importantly from my own inadequacies. Well running away really didn’t work for Jonah, and even though I spent zero time in the belly of a fish, it didn’t work out for me either. I couldn’t adjust at all. Everything was pretty much the polar opposite from what I had known all my life. My family has always been pretty close knit, and the loss of that daily support structure nearly destroyed me by itself. But I was also chasing an ideal, that ideal family. I didn’t know it at the time, but I had some very specific expectations for my marriage and my wife. Now, before you go there, no, I wasn’t looking for a little mild mannered lady who would do everything her husband said. Ugh. I’ve never wanted that, and still don’t. I wanted someone who was every bit my equal in all facets of life, and I got it. My ex-wife was very much that in every regard. The problem was that we were pretty much incompatible in every other way. That became obvious to me pretty quickly. It had been obvious to others in my circle of family and friends before that even, but I refused to listen at all. I was bound and determined to make it work. I was desperate to make it work. There were a lot of reasons that it didn’t work, most of them not fit to post here, but they rest in the pages of my journal. In the end I was trying desperately to smash a square peg into a round hole, and I tried so hard it damaged both of us. To make a long story short, I ended up back in Utah feeling like a total failure as my marriage circled the drain and finally ebbed totally away. I didn’t feel like I was any use to anyone, myself, my friends, my family, or certainly God. But over the last 4 years or so God has been redeeming me piece by piece. I know it, I’ve felt it, and others have seen it! It’s been nothing short of remarkable, and I haven’t really had much to do with it. I realized that was the stone that needs to be rolled away, and I’m happy to say that God is on the job, which is a good thing because I can’t do it myself. It’s not all the way gone yet, and it might never be this side of paradise, but bit by bit the light is shining through! I’ve been working toward the Local Pastor Program in the UMC, and last month God brought me to a mountaintop experience with that. I was invited to go to a church that is currently without a pastor to preach and deliver Communion. I was nervous because it was the first time in forever that I’d had to preach in front of people who didn’t already know me. But those wonderful people blessed me so much and it was such a privilege to share the Supper of the Lord with them. As I stood at the pulpit, opened my hands for the communion liturgy, and shared that with my brothers and sisters in Christ, I felt that Tooele, Utah was a long way from Orlando, Florida and that I was finally distancing myself from my failures there. Could it be that the stone is almost totally rolled away? I hope so, and no matter what your stone might be, hold fast to God and trust in him, because he is always with you! I’m going to get pretty personal here, so if that’s not your cup of tea, I won’t blame you for skipping this one. Anyways, here we go. Nine years ago I was sitting in the food court of a mall in Sanford, Florida. My fiance was working at a store in the mall, and sometimes I’d take a break from the job search and go hang out at the mall and the nearby bookstore while she worked, just to get out of the house. A couple of months earlier I had quit my job here in Utah, left my family and friends behind, and only packed what I could fit in two suitcases and moved to Florida via airplane. Ostensibly I was doing this to be with the woman who I thought I was going to spend the rest of my life with. I was wrong about that on many, many levels. I sat in that food court, an empty cup of coffee sitting in front me, and sighed. I had just finished talking to my mom on the phone, getting all the updates about my family and friends. I wouldn’t admit it at the time, but I was miserable. In the spring of 2007 I had graduated with a degree in forensic science from a very well respected program. The previous summer I had completed an internship at a local crime scene investigation unit with flying colors. If there was one thing Florida had in abundance, it was crime. This was the same town that in the near future would host the Trayvon Martin incident, and the murder of my wife’s aunt on her own doorstep. I figured with my excellent academic career and my internship experience I could get a job in no time. Well, I was wrong about that too. I had put in applications all over central Florida and was working my way into northern Florida. I had only gotten one interview despite several promising leads. We were living with my fiance’s family and she was working two jobs, without complaint, while I looked for my big break that I was sure was coming. It was not. I didn’t know that then, but I was starting to suspect it. Doubt was steadily creeping in and robbing me of the confidence that I had in my plan and my ability to execute that plan. I kept trying to tell myself that this was all the right way to go, but it never had been. I had the first of several panic attacks after my family had dropped me off at the airport to fly to Florida. I’ve never said this to anyone else, but those same feelings of panic were assaulting me on those days at the mall food court as well, I managed to keep them from breaking through, mostly, by focusing on my upcoming wedding and our honeymoon to the Bahamas. But I was far from happy, and not even close to content. I was born, raised, and lived my entire life in Utah. I was used to the majestic Wasatch mountains right out my back door, my family cabin, spin fishing on a river on my grandfather’s farm, and four distinct seasons. But I despised Utah, at least I thought I did. I was a young, brash liberal in a very conservative state. I detested the conservative political scene. I had dumped religion on the dung heap, despite the fact that I had wanted to be a pastor at one point. I certainly had no use for the Latter Day Saint culture in Utah, and every time an LDS person opened their mouth around me (which happens frequently in Utah) I felt that they were trying to “shove their religion down my throat.” Of course, they weren’t, and I was just being a judgmental jerk. In short I was full of myself, overconfident, and very angry. I wanted out of Utah. I figured that would solve all my problems. My best friend, Rick, warned me and told me he doubted that would be the case. I should have listened to him, and others. I was not made for Florida. They have two seasons: Hot and Muggy, and Not so hot, but still muggy. The beach, which was my fiance’s second home, held no allure for me, a mountain raised former scout. I got into the water once at New Smyrna Beach and looked out to see a shape floating in the water a ways off. I asked my fiance what it was. She rather casually told me that it was a shark. “Jaws” immediately started playing in my head, and I never went back into the ocean again after our honeymoon. Other things made me uncomfortable as well. People think that Utah is racist because of all the white folks around. That’s really not true. The LDS community really respects everybody (even though they have their bad apples, but we all do). I had heard the “N word” maybe 4 or 5 times in my entire life, but now all of the sudden people all around me were using it. A few people in our lives tossed it about quite liberally and people would kick around the joke “I think black people are great. Everybody should own one!” Then one day as I was walking our dog I happened across an African American man with his dog. I smiled and waved. He looked at me and then crossed to the other side of the street. I didn’t get it. Welcome to the south, Yankee boy (which my fiance’s family like to remind me that I was). Some months after we were married I got a job interview back here in Utah. I flew home for it, and just being back was a breath of fresh air. Rick took me down to see the new Real Salt Lake soccer stadium that was being built. I looked on the mountains again, this time with a deep appreciation. I didn’t get the job, but my new wife and I decided to move back here and give it a shot. I had many more interviews, but nothing ever came through. I got a job back working for the company I had worked for before, and my wife got a job working at Bed, Bath, and Beyond. I was convinced (still) that I was on the right path, but eventually I realized that my wife was as miserable here as I was in Florida. Plus, in hindsight I see that pulling her out of her family support so soon after a tragic death in her family wasn’t the right move. Eventually she went back to Florida to seek a job, with the understanding that once she got one, I would come back down there. If she didn’t, she would come back here after three months. None of that ever happened, and it’s a good thing. I would have been even more miserable. My wife’s family was already viewing me differently since we’d tried my plan twice and it didn’t work. Eventually, it all fell apart, and she asked for a divorce. I was reluctant to do that. When I took my vows I meant them, but there was nothing left to save. Needless to say I got even more angry. I hated myself and pretty much everyone around me. I had failed at finding a job in two different states. I had failed at being able to provide for myself and my wife. I had failed at marriage. I was an utter failure and instead of being sad, I got angry, very angry. I took over the job vacated by my wife and that was rocky at first. My family barely tolerated me, my coworkers walked on tip toes around me, and I exiled myself from all my friends. Then one day I came across a book called “A New Kind of Christianity,” by Brian McLaren. I considered myself an atheist at the time, but read it anyway. As I’ve said on this blog before, McLaren’s writings showed me that there was a way to be genuinely Christian without being judgmental, without being overly hard on yourself, and actually without voting Republican! I was skeptical at first, but my mind was opened. I talked to God for the first time in years. Not long after this, my parents invited me to the United Methodist Church that they attend to hear their new pastor, Rev. Gary Haddock. I had gone to church on Christmas once, but hadn’t heard him speak. They asked me to give him a chance. I did. Without knowing a thing about me or where I was coming from he stopped that Sunday morning and gave me a huge hug. I kept going back, and he kept giving me hugs! During this time I also came face to face with the life and teachings of John Wesley. Finally I felt that I had come across genuine Christianity, not perfect, but genuine. I was on the right road, but I didn’t know it yet. Right about the same time we hired what I thought was a rather shy young lady at work named Mattie. We hit it off right away, and really for one of the first times in my life, I found somebody outside of my family or my friend Rick that was really interested in me as a person and what I had to say. Mattie encouraged me every time I saw her. She opened her heart and her ears to me in a way that I didn’t know was possible outside of the love of Christ himself. Over the next couple of years we became great friends and I was able to cast my burdens onto her seemingly huge shoulders. I was also able to help her through some things as well, and hopefully gave her the same opportunity she gave me. She’s down in Texas now, but remains one of the most special people in my life and I thank God for her. I also thank God for Sara. Sara was another one of my coworkers and then a manager. I’m pretty sure she’s a saint. Much like Mattie she let me unload quite a bit when I needed it, which was often. Sara also brought me face to face with the stereotypes and anger that I held about LDS people. Even though I had discarded most of those old views as I embraced Wesleyan thinking, getting to know her helped me to realize what a jerk I was in my younger years. I needed that, I needed to be able to admit that. She’s gone through some tough times as well, and I hope that I was able to, again, be the comfort for her as she was to me. Meeting these people: Pastor Gary, Mattie, and Sara as well as the support from those who had always been there for me: My family and my friend Rick, helped me to do something. They helped me to surrender. I finally was able to look my own shortcomings in the eye, not as a way to beat myself up, but to realize that I can’t do any of this on my own. I had been so caught up in MY PLAN and MY ABILITIES that I failed to realize the important truth that I had always been taught in church: “In Him we live, and move, and have our being.” (Acts 17:28). I had not grounded myself in this being, and as the old parable says, I was the fool who built his house upon the sand (Matthew 7:26). I gave up, and I gave into Christ, which is to give into love and grace. Once I did this, I was slowly able to surrender all that hate, all that frustration, and all of that anger as well (not that they don’t flare up from time to time). As I go further into what God has in store I look at the times that I’ve described in this entry as a time in the wilderness, or perhaps like the times Paul was tested in prison. Though not in physical prison, I was in a prison created by my own arrogance and anger. Thus, Paul’s writings in Philippians (cited above) mean a lot to me. I am not a failure. I am a work in progress, and God’s not going to stop until the day of Christ. I trust Him to complete it, and submit to doing my part to make it happen. After all, I gave up on Jesus once, but he never gave up on me, nor will he! I know it’s not going to be all easy sailing from here on in. In fact, I realize that having tough times is part of the deal and there’s not always an answer for them. There’s still a divorce to finish. There’s still work to be done in securing my future, but God is there, as are my family and friends. So today I sat at a blood pressure machine. I take a blood pressure medicine and an anxiety medication (both of which I’m sure have been instrumental in all of this as well). When the test was done I looked down and saw 117/63. Wow. I hadn’t had readings that low in forever! Also, I really want to go on a trip that Pastor Gary is leading to Italy next fall, and I’m going to work to make that happen! Plus lately everyone has been very encouraging to me as I seek to possibly enter the ministry. This afternoon, in one of my more wistful moments, I allowed myself a dream for the first time in forever. I pictured myself on a boat in Venice, which was great, and maybe, just maybe even sharing that moment with someone who is special to me. I have no clue if any of that would ever work out, but I haven’t even allowed myself those lighthearted feelings since I sat alone at a table at a mall food court in Sanford, Florida, nine years ago. Nine years ago I was entering a deep despair that would last nearly a decade. Now I’m here, allowing myself to dream again. Maybe, just maybe a year from now I’ll be in Rome, Lord willing. From Florida, to Utah, to Rome and back again? Who says you can’t go home? What makes an adventure story great? What makes it an ADVENTURE? Think of some of the classic adventure stories: Star Wars, Indiana Jones, Lord of the Rings…just to name a few, think about what makes them so great. I wonder, would they be as great if the characters in the story never faced any problems? Would Lord of the Rings be worth reading or watching if Frodo and Sam jumped on a direct flight to Mordor, took a cab to Mount Doom, dropped off the ring, and were back in the Shire for dinner the next day? Would Indiana Jones be as cool if he just opened up a book that told him right where the Ark is, and he went and picked it up? Would Star Wars be as great if Luke, Han, and Leia just dropped a big bomb on the entire Imperial government and went home? I’ve been thinking a lot about adversity as 2016 has kicked off. I’ve been a little down, honestly, thus the lack of posts so far. When I first looked ahead into what 2016 had in store, the negative things seemed almost overpowering. My job doesn’t provide for my needs, and in spite of things my bosses have told me, that doesn’t look like it’s going to change anytime soon. One of my closest family members is gravely ill with cancer, and we’re all seemingly at a loss as to how to help and comfort him and the rest of the family. I recently had an individual at church say hurtful things about me in front of other people, which then ended up being accidentally advertised to our adult Sunday School class, a group I teach on occasion, and I just felt crushed and embarrassed. It was the first time in the nearly 2 years since I went back to church that I just wanted to run and hide under a rock. For the last couple of weeks these and other things have had me in such a rut. I’ve been angry, I’ve been sad, and I’ve been at a loss as to where to go next. My spiritual life just flat lined as for the first time in awhile I couldn’t feel the tangible presence of Christ. So I exercised my ultimate defense mechanism, I withdrew. But something interesting happened as I withdrew down deep into my most protective shell: I found that I wasn’t alone. Despite my insistence on shutting others out, I found that there was somebody who was still there just waiting to comfort me. I didn’t go to church this morning. I didn’t sleep well last night as chronic knee pain kept me awake much of the night. I hadn’t showered, I needed a shave, and I had no clean clothes, all because of this little withdrawl that I’ve been on. Plus, I just really didn’t want to go and face questions about the things that were said to me and about me. I was pretty low. There weren’t two better words for me to focus on right now. 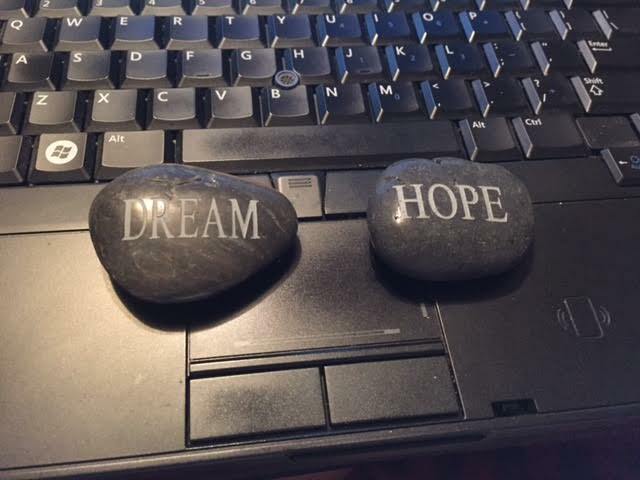 I held these rocks in my hand this afternoon, the football game on mute, and pondered their meaning. Then the verse from John that I quoted above came to mind. It had come up in conversation earlier in the week, and when I paired it with the message that I felt that the Spirit was communicating with these rocks, then I realized that no matter how bad I felt, how alone I felt, how much I withdrew into myself, that Christ is still there, still working, if I’ll just let him. And I, I’m glad I didn’t know the way it all would end, the way it all would go. Our lives are better left to chance. I could have missed the pain, but I’d have had to miss the dance. 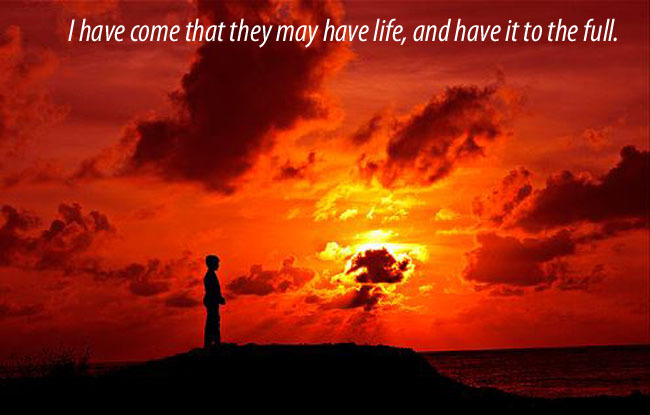 Of course, as Christians we ultimately believe that our lives are not left to chance at all. We believe that God is conspiring to work all things for good, but doesn’t mean that there won’t be pain, hurt, and heartache involved. And if you try to sit somebody who is in a lot of pain down and just tell them that it’s all “God’s plan” or “Just have faith,” you deserve to be slapped in the face. The pat answers aren’t good enough for many. We must recognize the pain and the trials that we each must go through, but Christ, and the people of Christ, can be the ultimate comforter if we but let them try. I had to open myself up a bit to see that again with fresh eyes. The answer isn’t to hide in one’s self, it’s to put yourself out there and let others help, even though they may hurt you again in the process. So as I sit and look ahead now into 2016, I’m clinging to what Jesus said, that he gives life and gives it abundantly. I’m going to try really hard to dream big and hope a lot. Maybe, just maybe, I can turn the pain and adversity into opportunities for growth in all areas of my life. It’s not going to be easy, and it’s not going to work right all the time, but it will certainly be an adventure, perhaps a noteworthy one for me, and no matter what the Good Shepherd will be at my side.